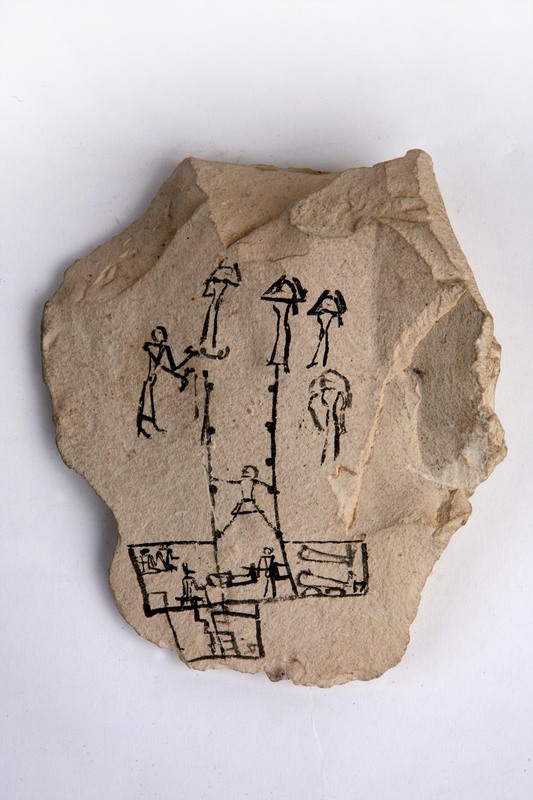 An Egyptian Ostracon with Professional Mourners inside the Tomb. Ostracon with funerary scene. New Kingdom. Manchester Museum. Last week we could read about ostracon 5886 in Manchester Museum. In that skecht the Egyptian artists represented what happened outside the tomb. Let’s see now what happened inside. 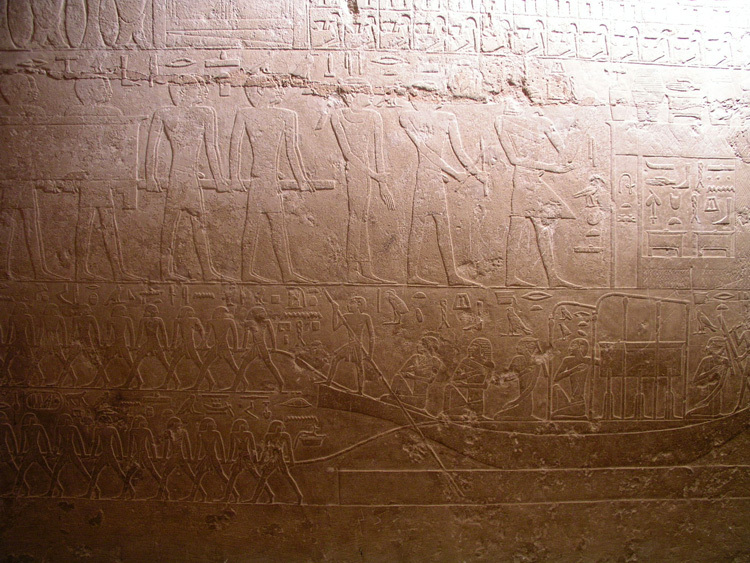 Inside the tomb, a man is descending and some others appear in the funerary chamber carrying the coffin. But there are two important things: a man with a jackal head is next to the corpse and two kneeling figures are in a corner of the chamber. Acccording to Campbell Price the coffin would be being placed into the tomb, which is completely true. But was it necessary for placing the coffin a man with a jackal-headed mask and those two kneeling figures? Ostracon with funerary scene. Detail of the inside. New Kingdom. Manchester Museum. The schematic scene would in fact represent what happened inside the tomb for reviving the deceased. We have already seen that the Egyptian Opening of the Mouth ceremony would happen inside the tomb and that the two mourners in the role of Isis and Nephtys were a part of the party making a mourning rite in favour of the mummy. The man with the jackal-headed mask as a living image of Anubis would play the role of the embalmer. In our opinion these two kneeling figures would be the two representatives of Isis and Nephtys. In fact the scene shows the members of the common Egyptian scene in which Anubis assists the mummy while Isis and Nephtys are (standing or kneeling) at both ends of the corpse. The difference here is that these ones stay apart in the chamber and already with their short hair. The man on the right seems to hold with his hand a long straight object, which seems to be more similar to a kind of strike than to an incense burner, Could we consider it as the adze used in the Opening of the Mouth ceremony? Both men are holding the mummy as if they wanted to place it down in the shaft after having finished the rites. It does not seem too ridiculous to think that such schematic skecth would represent the end of the Opening of the Mouth ceremony and the moment in which the mummy is finally buried. Meanwhile the two professional mourners in the role of Isis and Nephtys would wait kneeling and already with no mane of hair until the dead is placed in the burial place and the shaft is sealed. While that was happening inside the tomb, outside the common mourners would be lamenting, three of them with raise arms and one of them with hair on her face and her arms hanging down. An Egyptian Ostracon with a Disheveled Mourner. 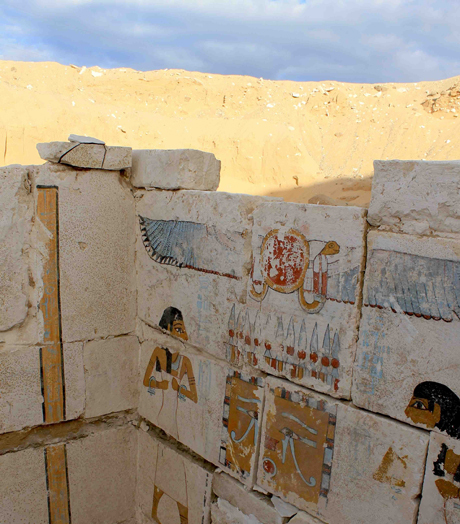 Funerals of Ancient Egypt are usually known thanks to funerary scenes from the tomb walls. However, small objects can also give a very useful information. That is the case of a limestone ostracon from Thebes and in the Manchester Museum (Acc. no. 5886), which dates from the New Kingdom. An Egyptian artist drew on it an ink sketch with a scene of a funeral. The scene represents an Egyptian burial (there is a post written by Campbell Price in the blog ofthe Manchester Museum). The plan of the tomb is seen from a bird’s-eye view, while the members of the funerary team and the coffin are shown from a front view (the combination of different visual plans was normal in Egyptian art). Ostracon with funerary scene. Detail of the common mourners. New Kingdom. Manchester Museum. Outside the tomb a group of mourners are standing while weeping and a priest is with them burning incense and pouring water. Although it is not too clear, it seems that the artist pretended to draw one of these women with a lock of hair falling in front of her face. It should be pointed out that, while the three others appear with her raised arms, the mourner with the hair falling on her face has her arms hanging down. Why? Egyptian artists had several ways of representing the lament: tears droping on the face, raised arms, arms crossing on the chest, hands covering the face, hands over the head, hair falling forwards, hair covering the face…Probably the artist who drew this sketch chose to represent three common mourners with raised arms and another one with hair falling on her face. Common Mourners in the tomb of Rekhmire. Photo: Mª Rosa Valdesogo Martín. In fact, a very similar solution found the Egyptian artist in the tomb of Rekhmire (TT100), where some mourners are kneeling with their hands on their head, some others are standing with crossed arms on their chests and another one stands also with crossed arms but with the mane of hair covering her face. 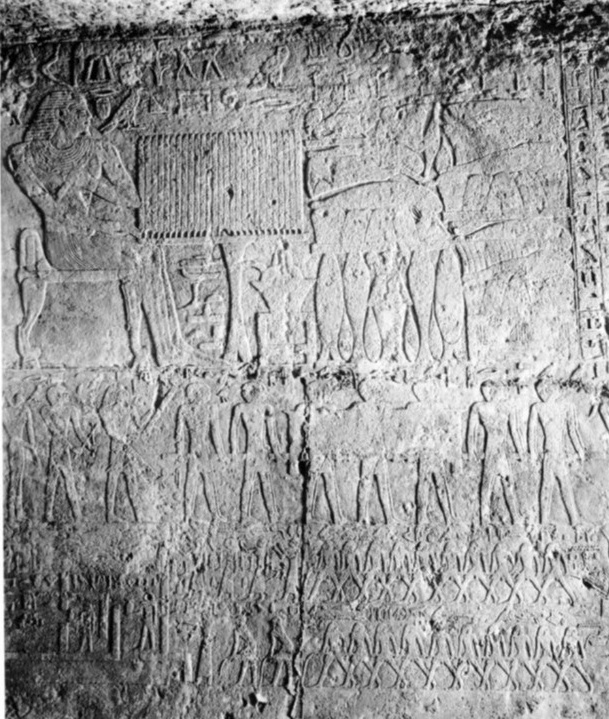 Also in the tomb of Amenemhat (TT82) we can see a group pf common mourners among who, some raise their arms, some cover their faces with their hands and two make the nwn gesture of shaking hair forwards. With them a priests holds an incense burner and a purifying water vessel. The same scene as we can see in the ostracon of the Manchester Museum. The scene of this ostracon could be considered as an schematic way (or an “ostracon version”) of the nwn gesture made by a common mourner.